The two Chinese zodiac signs of the tiger and the Sheep might be able to have a contented relationship. The Tiger might be very happy being strong and protecting the sheep. They value their individuality and their freedom. They will like being in control. They are bold, brave and a natural leader. They are sociable and motivated. They enjoy a fast-paced lifestyle. The goat or sheep Chinese astrology sign is romantic and will fall easily in love. They can be very demanding. They are emotional, artistic, and somewhat anxious. They require a lot of encouragement, support, and even compliments from their partner to feel safe in a relationship. The tiger and the sheep might have to work hard to have a relationship that is compatible for both of them. The tiger and the goat will need to accept each other to make the Tiger Goat relationship successful. The tiger is brave and confident. They will be very appealing. They might not be able to give as much love and understanding as their partner would like them to. When the tiger is dating the sheep, the more secure the goat feels with their partner, the more demanding they will be of their partner. The Chinese sheep animal sign might not worry so much about their independence. They have a creative and inventive mind. They will see any lack of encouragement for their artistic nature to be restrictive and they will not like this. They might even be lazy. They would prefer to stay at home. They want a calm and cozy home. They have a hard time accepting their partner’s carefree nature. The tiger and goat both love to travel. They both enjoy different and foreign things. The goat adore the tiger’s appeal and beauty. The tiger adores the goat’s artistic and emotional nature and encourage the their goals. The tiger and the goat in love might have problems if they are in a romantic relationship. They both might not be content in the relationship. If the goat demands too much of the tiger, then they might run. The sheep might not like their partner’s forceful nature. Once the Tiger Sheep breakup there might be no looking back. However, the tiger does not like the goat’s lack of independence or clingy nature. The female goat will not be dominant in the relationship. They might feel that the male tiger is blunt and not interested in emotions. The calm sheep might feel hurt by the tiger’s bad temper. Even in bed the Tiger and Sheep might find it difficult to be sexually compatible. A tiger wife and goat husband will have trouble with communication. Both the tiger woman and the sheep man will have disagreements in the relationship. They will have problems having a friendship that is successful. A tiger husband and goat wife will have a difficult relationship. The tiger man and the sheep woman will be attracted to each other. However, this might not be enough. Each will want to change the other and this won’t happen. The male tiger will not like the female goat’s mood swings. She will not listen to his criticisms in this tiger sheep marriage. It is difficult to imagine the tiger and sheep as soul mates unless they make tremendous efforts to make their love compatibility a success. 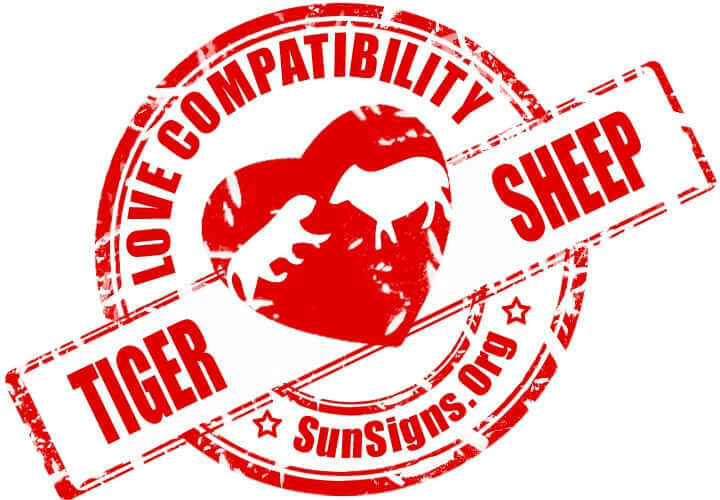 Tiger & Goat Chinese Horoscope Compatibility Rated 3 Hearts! Which Disney Prince Is Your Boyfriend?